Sunnyside Guest House Guest HouseSunnyside Guest House in Keswick (English Lake District) is just a short walk from the town centre and Derwentwater. It has seven comfortable guest rooms including three doubles, a twin, two singles and a triple bedded room all of which are en-suite. We also offer off street car parking for up to seven vehicles . 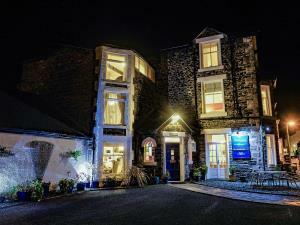 Sunnyside is run by its owners Nicky and Paul and provides Bed & Breakfast accommodation using local Cumbrian supplies. We pride ourselves on the comfort and cleanliness of our guest facilities and we will help make your stay with us special . We have a large, comfortable and relaxing guest lounge with a pod coffee machine , a fridge with fresh milk and cold drinks, a large selection of fiction and non-fiction books, local interest books, maps and information together with a good selection of games and puzzles. Sunnyside Guest House sometimes limits bookings to 3 or more days. A double bed with bedside tables and a large wardrobe. Comfortable seating is provided and a stool located at the dressing table. A flat screen TV with built in DVD player is located on the wall with an adjustable bracket. The en-suite has a large corner shower and a range of toiletories are provided. Located on the 1st floor, it has a 2 single beds with a bedside table and a large wardrobe. A flat screen TV is located on the wall with an adjustable bracket. The en-suite has a large corner shower and a range of toiletories are provided. Leave M6 jct 40 and take the A66, following directions for Keswick town centre. At crossroads, opposite the war memorial, turn left and left again into Southey Street. Sunnyside is approximately 150m on the left. Overall friendly atmosphere, good room and excellent breakfast. The location could not have been better.